ZIFA yesterday heaped praise on top Zimbabwean referee Norman Matemera after he upheld integrity in rejecting a $10 000 bribery attempt by Equatorial Guinea outfit Desportivo Niefang to influence the result of their decisive CAF Confederation Cup play-off tie against Cote d'Ivoire's Williamsville Athletic Club last Wednesday. Matemera, who took charge of the Harare Derby on Sunday, handled the April 18 encounter between Desportivo Niefang and Williamsville Athletic Club in the Equatorial Guinea city of Bata which the hosts won 2-1 but still bowed out 3-2 on aggregate after having fallen 2-0 in the first leg in Cote d'Ivoire. But there was drama on the eve of the match as Desportivo Niefang officials, working in cahoots with Togolose match commissioner Lawson Mahuwe as their emissary, tried to offer Matemera and his assistants Brighton Nyika, Salani Ncube and Pilan Ncube a cash bribe of $10 000 to ensure the Equatorial Guinea side won the match to advance to the group stage of the competition. Matemera, however, resisted those attempts and instead reported the incident to the Confederation of African Football. ZIFA Referees Committee vice-chairman, Gladmore Muzambi, yesterday hailed Matemera. "We are saying to our international referees, and indeed the local ones, we must always uphold the integrity tenets which entails recognising, resisting and reporting any attempts of match manipulation. "You must recognise that there are attempts to fix a match, you must resist those attempts and you must report those attempts. In this regard we feel proud that our referees did just that," Muzambi said. Muzambi also noted that Matemera's case had somewhat been complicated by the fact that the match commissioner was guilty of complicity. "It is quite unfortunate that in this case it involved a match commissioner and it is a situation which makes you wonder who is going to guard the guard when those entrusted to guard are the guilty ones because the match commissioner was the one being used as the go-between in the home team's bribery attempts. "But really what Matemera did speaks volumes of our honesty as a country on such issues. "The referee reported the matter to CAF and I believe CAF are already seized with it. We believe CAF have adequate machinery to deal with such issues," Muzambi said. 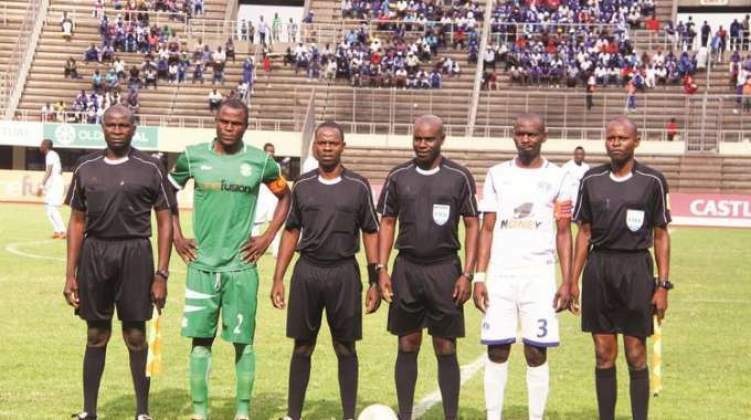 The veteran Zimbabwe referees' administrator said he was also saddened to hear that Matemera and his assistants had been dumped by the Desportivo officials after the match, seemingly being punished for botching their bribery attempts. "It is so sad that after the referees turned down their bribery offer, the club dumped them and they had to pay for their own meals at the hotel as well as transport to the airport". The Togolese match commissioner also reportedly left for the Equatorial Guinea capital Malabo without further checking on the referees. Matemera, one of the top officials in COSAFA, becomes the second official from the region after South Africa's Victor Gomes to resist the bribery carrot that had been dangled before him. The 35-year-old Matemera is also the only Zimbabwean on the CAF Elite B panel, which enables him to be considered for such competitions like the African Nations Championships. In December last year he came close to being selected among the crew that officiated at the CHAN tournament in Morocco with a pulled muscle cruelly ruling him out of contention. Gomes refused to be bribed ahead of another Confederation Cup tie between Plateau United of Nigeria and Algeria's USM Alger.